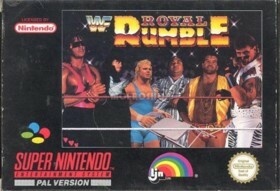 WWF Royal Rumble is a Super Nintendo game in the Sports genre. The game was published by LJN and developed by Sculptured Software. The game has an ESRB Rating of RP Rating Pending and was released on 1993-09-01. The game does not have an official site. A classic wresting game that is pure fun. What a fun WWF/WWE wrestling game. This game features 12 WWF superstars (The Undertaker, Ric Flair, Yokozuna, Mr.Perfect, Razor Ramone, Tatanka, Shawn Michaels, Crush, Brett Hart, Macho Man, Lex Luger and Ted Dibiase). It was developed by LJN and features excellent graphics, sound and music. The details are actually quite good for the time and the various game modes such as “no holds barred” are quite fun. I really recommend this classic game for anyone looking for a fun good WWF game (unlike the current games).